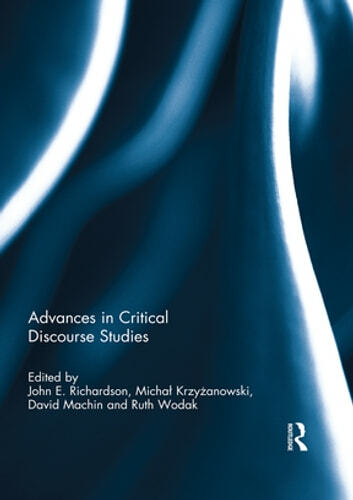 Advances in Critical Discourse Studies collects ground-breaking scholarship and cutting-edge research which reflects significant shifts in Critical Discourse Studies, exploring the field from theoretical, analytic and methodological perspectives. Innovative chapters analyse a diverse range of discourses including journalism, mass media, political communication, policy documents, interviews, photographic archive and official bodies. The chapters in Part I explore Critical Discourse Studies from the point of view of history, memory, identity politics, and discourse, analysing salient examples of how memory and recollection of the past shapes understandings and narratives of the present, and visions of future societies. Part II explores problem-oriented analysis in Critical Discourse Studies and examines the roles that discourse plays in the formation, perpetuation and transformation of class relations. Finally, Part III explores a methodological issue by looking at the benefits of reinforcing fieldwork and ethnographic analysis in Critical Discourse Studies. The case studies throughout the book demonstrate that analytic research contributes significantly to the in-depth and in-situ research of a variety of increasingly complex social, historical, political and economic contexts. This book was originally published as three special issues of the journal Critical Discourse Studies.